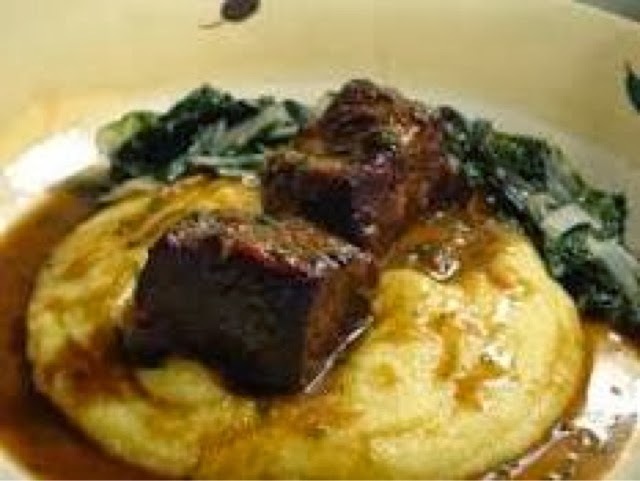 This past weekend I shared a picture of one of our favorite meals: Braised Beef Short Ribs. This recipe originates from The Food Network courtesy of Chef Anne Burrell. I have made this several times and It always turns out perfectly. Chef Burrell serves it over mashed potatoes but I prefer a quick cooking polenta with Southern Greens on the side as shown. Tomorrow I will share with you how I used the leftovers! Susan, Michael Symon from the Chew said that adding an Anchovy paste to the base brings out even more flavor. I’m going to add that to the vegetable mixture next time!